Biscuits and gravy is one of my favorite breakfasts. 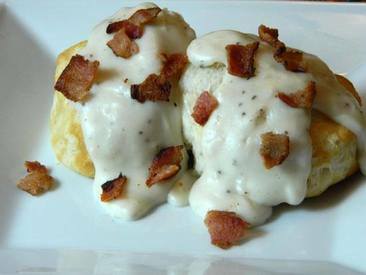 Every weekend, I wake up wondering what I can make and biscuits smothered with a country white gravy always comes to mind. I don’t always keep sausage in the house but I usually have Bacon in the fridge or freezer. So one day I woke up and I was craving biscuits and gravy and found Bacon. I imagined what the gravy would taste like cooked in the same pan as the Bacon and voila…YUMMY! Give this delicious Bacon Country Gravy a try this weekend!